I I reviewed Katherine Center's new novel, How to Walk Away (St. Martin's Press), for Lone Star Literary Life! 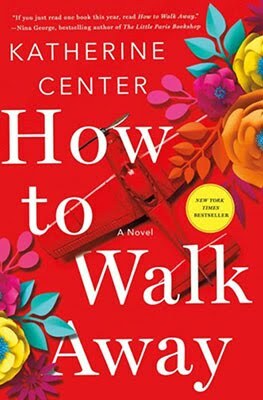 "As is Center’s specialty, How to Walk Away is sweet without the sap, an uplifting, feel-good tale without being predictable." Margaret Jacobsen has her fingertips on the brass ring. She’s the beautiful, dutiful younger daughter of Anglo, upper-middle-class strivers in Austin, Texas, possessor of a brand-new MBA degree, favored candidate for a dream job, and certain her longtime boyfriend, Chip, is going to propose to her today. The only clouds in Margaret’s sky are an estranged older sister and an intense fear of flying, which is unfortunate because her phobia may limit their choice of honeymoon destinations and Chip is in the process of earning a pilot’s license. Margaret was right; Chip did propose to her—after bullying her, in that jocular but insistent manner every woman on the planet will recognize, into the cockpit of the Cessna he had been training in and promptly crashing it, the plane cartwheeling before wedging in a ditch and catching fire. Chip escapes but Margaret must be cut out of the wreckage, requiring skin grafts, questioning whether she’ll walk again. How to Walk Away: A Novel is the latest work of contemporary fiction from Houston’s Katherine Center. A graduate of the University of Houston’s renowned creative writing program, Center has published six novels. As is Center’s specialty, How to Walk Away is sweet without the sap, an uplifting, feel-good tale without being predictable. Initially I thought Margaret’s wisecracking in the immediate aftermath of a spinal cord injury incongruous (“They say everybody loses time in the ICU. It’s basically Vegas in there, minus the showgirls and slot machines.”), but then I realized her first-person narrative is a fictional memoir, told from the remove of a decade. In the beginning, Margaret is a likeable enough character—if lacking in backbone—a generic yuppie aspiring to McMansion-hood, but she tells her story from the future as a transformed woman, a nuanced, sympathetic character. The remainder of the cast have fewer dimensions than Margaret and don’t receive the same opportunities for growth, but are interesting and entertaining, nevertheless. Margaret’s father is understood to be active behind the scenes; her mother is almost insufferable (“[Mom] could always find the downside. And she had no filter, so once she found it, everybody else had to find it, too.”); Chip proves to be an asinine coward of breathtaking selfishness (“Do you know I escaped that crash without a scratch?” Chip said … “the plane is totaled. You … are totaled.”); Ian the Scottish physical therapist is appropriately brooding and mysterious; older sister Kit makes her energetic, grand re-entrance as a breath of fresh air. Center’s writing is markedly emotionally astute—I suspect she was a psychoanalyst in a former life. Her families are authentically complicated, her characters’ interactions fraught with the disconnect between heart and mind. Center is particularly good at conveying shock and grief, employing a blend of sardonic nonchalance that should be patented. Center’s technique allows the devastation to sneak up on you. When you begin feeling too relaxed, understand that you’re about to get smacked with a doozy of a plot twist. How to Walk Away is quickly and evenly paced. Subplots involving the estranged sister, a difficult mother, the hospital edition of office politics, and the possibility of new romance service the main plot line instead of distracting from it. How to Walk Away is recommended reading for your summer vacation, whether you take it to the beach or your backyard hammock.